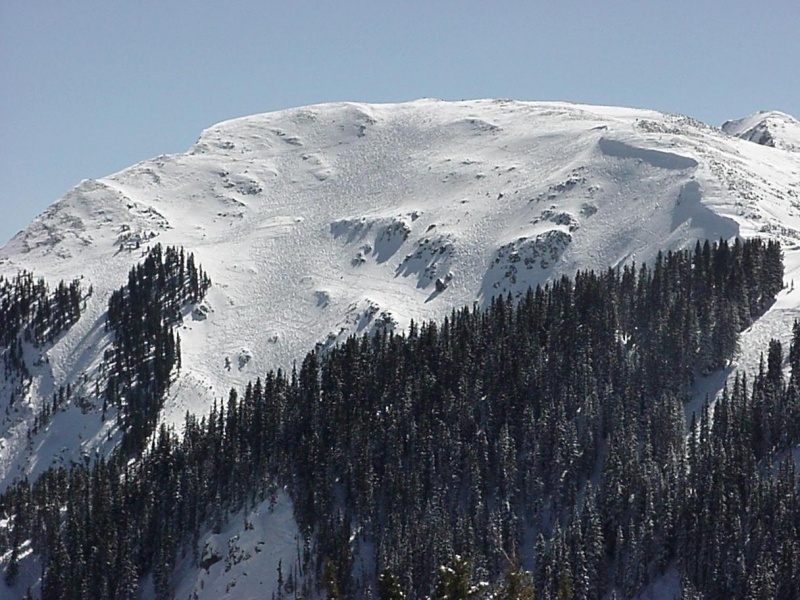 Taos Ski Valley, NM – The U.S. Forest Service has approved a plan to expand Taos’ lift-served terrain by 60 percent, with two new lifts accessing the high alpine summit ridge and Kachina Peak for the very first time. Phase 1 of Taos Ski Valley’s new Master Development Plan, developed in April 2010, was approved in a Record of Decision published by Diana Trujillo, acting supervisor of the Carson National Forest. Trujillo explained that Taos needed the high alpine expert terrain to remain competitive with neighboring ski resorts in Colorado. Much of Taos’ high alpine terrain can only be reached currently by a hike above the lifts, and the U.S. Forest Service’s approved plan calls for the installation of two new lifts to access this popular high alpine terrain. The proposed Ridge lift would be an 800-foot fixed grip quad that would eliminate the hike to the West Basin Ridge at Taos. More spectacularly, the Main Street Lift would be a 2,560 foot fixed grip triple that would terminate at 12,450 feet of elevation, just below the summit of Kachina Peak. More than half of Taos’ current hike-to terrain would become lift served under the plan, but access to the resort’s Highline Ridge would remain for hikers only. 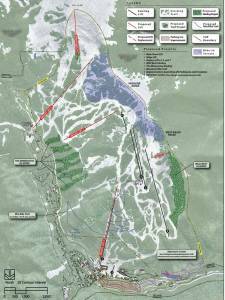 The plan, as approved, also calls for the upgrading three lifts at Taos Ski Valley. Lift 4, the only lift accessing the resort’s eastern portion, will be upgraded to a high-speed detachable quad, as will Lift 5 to improve uphill capacity out of the base area. The upgraded Lift 4 will also access the proposed new Main Street lift. Lift 7 in the center of the resort will be upgraded from a fixed-grip triple to a fixed-grip quad. Two new gladed areas will be thinned for advanced intermediate to expert skiers, including nearly 32 acres in the Wild West Glades from the top of the West Basin Ridge to Lower Stauffenberg, and roughly 40 acres of forest in the Minnesotas Glades accessible from the bottom of Lift 7. A snow tubing area will also be constructed on an acre and a half of mixed private and Forest Service land known as Strawberry Hill near the ski area’s existing Lift 3. It will feature four lanes ranging in length from 250 to 280 feet, with uphill transported provided by a 250-foot conveyor lift. The mountain biking trail will stretch for 3.6 miles from the top of Lift 1 to the base area. 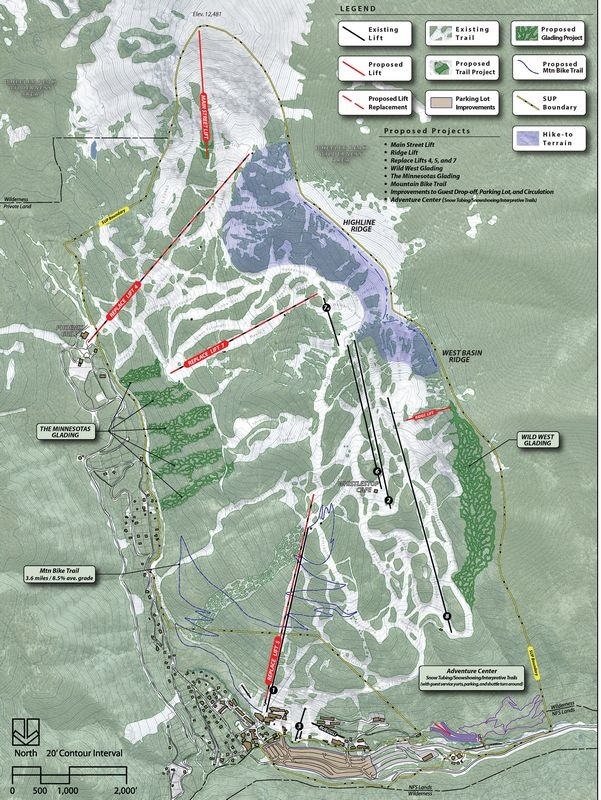 Plans further call for the establishment of a snowshoe trail and development of a lift-served mountain bike trail to be available during the summer, along with reconfiguration of the parking lots and the development of a new drop-off area to improve the sense of arrival. All elements are expected to be completed over the next several years, and all will take place within Taos Ski Valley’s existing 1,268-acre special use permit area.